Erythropoietin (EPO) is a type I cytokine that utilizes different receptor isoforms either to maintain hematopoiesis or protect against injuries that arise from widely diverse etiologies. EPO also facilitates healing by reducing inflammation and mobilizing endothelial progenitor cells to participate in restorative neoangiogenesis, but it is unclear which EPO receptor isoform is responsible for healing and whether this receptor use varies according to the type of wound. In the present studies carried out in the rat, we have utilized receptor-selective derivatives of EPO to determine which receptor type operates in (i) a nonischemic wound (skin punch biopsy), (ii) a permanently ischemic wound (raised musculocutaneous flap), (iii) an intermittent ischemic reperfusion wound (pressure or decubitus ulcer), or (iv) wounds complicated by infection (cecal ligation and perforation). Using these models, we demonstrate that nonerythropoietic tissue protective compounds administered immediately following injury limit wound size and accelerate eschar closure independent of wound type. Moreover, in a model of peritonitis-induced adhesions, daily administration of the nonerythropoietic derivative carbamyl-EPO (10 µg/kg-bw) was associated with significantly lower serum TNFα concentration, illness scores, increased survival, as well as decreased adhesion formation. These results confirm that wound healing is mediated by the tissue protective receptor isoform and argue that nonerythropoietic tissue protective molecules constitute promising new therapeutics for treatment of a wide variety of surgical wounds. Erythropoietin (EPO) is a well-known stimulator of erythrocyte production and widely used in the treatment of anemia caused by kidney disease, cancer, or chronic inflammation (reviewed by Jelkmann ). Over the past decade, it has become evident that EPO also possesses many other biological activities that can generally be summarized as counteracting the actions of proinflammatory cytokines and their deleterious effects in tissue injury (reviewed by Brines and Cerami ). In these nonhematopoietic activities, EPO is locally produced in the immediate vicinity of the injury. Cross-talk between the circulating hematopoietic and the local tissue protective pools of EPO is avoided by the presence of EPO receptor isoforms that differ greatly in their affinity for EPO. Specifically, the hematopoietic receptor is a homodimer composed of identical EPO receptor (EPOR) subunits that maintains erythropoiesis in response to circulating levels of EPO in the 1–10 pMolar range (3). In contrast, the tissue protective receptor is postulated to be a heteromer formed by EPOR in assembly with CD131, the β common receptor which also is used by GM-CSF, IL-3, IL-5, and other type I cytokines (4). The tissue protective receptor exhibits a lower affinity for EPO (2–20 nM) and therefore does not respond to EPO at concentrations present within the circulation, but rather only to high levels of locally produced EPO. An additional important functional separation between the hematopoietic and tissue protective systems arises from the difference in basal expression of the corresponding receptors. In hematopoiesis, the homodimer is expressed continuously by a population of red cell precursors that require constant circulating EPO to enable survival. In contrast, the tissue protective receptor typically is not expressed until after the occurrence of injury or significant metabolic stress and only requires a brief exposure to EPO to trigger sustained biological activity (2). When employed at the high doses required for adequate tissue protection, EPO unfortunately possesses use-limiting side effects, particularly in converting the vasculature into a prothrombotic state, which leads to an increased risk of life-threatening thromboses, as has been observed particularly for injured patients (5) or those with cancer (6). The identification of distinct hematopoietic and tissue protective EPO receptor isoforms initiated the quest for molecules that exhibit a high specificity for the tissue protective receptor subtype to avoid the adverse effects associated with EPO therapy. As a result, a number of nonerythropoietic tissue protective compounds (TPCs) have been developed that interact exclusively with the tissue protective receptor, including carbamyl-EPO (7), as well as peptides that mimic the three dimensional structure of EPO (8), for example, pyroglutamate-helix B surface peptide (ARA 290, Araim Pharmaceuticals, Ossining, NY, USA). The utilization of these reagents has led to an understanding of the major differences in biological effects of the hematopoietic and tissue protective receptors. For example, while the hematopoietic EPO receptor activates the endothelium into a prothrombotic state, increases platelet number and reactivity, and increases systemic blood pressure via constriction of vascular smooth muscle, the tissue protective EPO receptor activates none of these activities (9). Among the pleiotropic effects of EPO reported, a number of investigators have reported significant activity of EPO in promoting the healing of ischemic raised cutaneous skin flaps (10–14), ischemia-reperfusion in random musculocutaneous flaps (15), incisional wounds (10,13), and in colonic anastomoses (16,17). Additionally, skin thermal burns also have been reported to respond in a beneficial way to EPO (18). In other models, EPO has been shown to increase the formation and quality of granulation tissue (19). In contrast to the direct, nonhematopoietic actions, it has been postulated that EPO can benefit healing of chronic wounds by augmenting the delivery of oxygen via increases in the hematocrit (20). It is currently unclear which receptor isoform transduces EPO’s activity in the setting of wounds and, therefore, whether TPCs could be reasonable candidates to avoid EPO’s adverse effects in this therapeutic area. In the present work we examined the action of TPCs on the development and resolution of injury in a variety of wound etiologies: i) a predominantly ischemic wound; ii) an ischemia-reperfusion wound model; iii) an incisional wound in which ischemia plays a limited role; and iv) infectious peritonitis that produces adhesions. Because we were interested in modeling potential clinical scenarios that often cannot be anticipated, dosing of TPCs was initiated only following wound injury. The results show that TPCs effectively limit injury, accelerate healing, and reduce adhesion formation, confirming a role for the tissue protective heteroreceptor in this activity. All experiments were performed under protocols approved by the local animal use and care committee and complied with the standards in the Guide for the Care and Use of Laboratory Animals, prepared by the Institute of Laboratory Animal Resources and published by the National Academy Press (21). Male Sprague Daw-ley rats of 275–300 gm body weight were used for these experiments. Each animal was acclimated for at least 1 wk prior to experimentation, maintained under a reverse light-dark cycle, and were able to access food and water ad libitum except as stated in each individual protocol. Following surgical wounding procedures, each animal was individually housed for the duration of the experiment. EPO was obtained from Dragon Pharmaceuticals (Vancouver, BC, Canada). Carbamyl-EPO was prepared as published previously (7). ARA 290 is an 11 amino acid peptide of molecular weight 1,258 synthesized by standard F-moc solid phase peptide synthesis and purified by HPLC and ion-exchange chromatography. Animals were fasted from the evening before the procedure. Under isoflurane anesthesia, a region of skin 5 × 5 cm was shaved on the dorsum in the subscapular region, washed with povidone-iodine solution, and followed by a sterile water rinse. Four full-thickness skin punches were placed at the corners of a 2-cm square using a 3.5-mm-diameter (area =9.6 mm2) disposable sterile biopsy punch. A drop of 1% lidocaine solution was placed into the wounds followed by application of 1% lidocaine-saturated gelfoam attached by adhesive tape. Animals then received one of three treatments in a blinded fashion. Group 1 (n = 9) received a daily subcutaneous saline injection in a central location, equidistant from each punch wound. In a similar fashion, Group 2 (n = 6) received EPO at 500 IU/kg-bw (~130 picomoles [pmol]/ kg-bw), and Group 3 (n = 9) received 1 nanomole [nmol]/kg-bw of the tissue protective peptide ARA 290. Wound assessment was accomplished by digital planimetry of eschar area using dimensionally calibrated serial digital photographs on d 0, 1, 3, 7, 10, and 14. Wound size was expressed as the ratio between the wound area and a size standard. (22). This experiment was performed twice with similar results. Under isoflurane anesthesia, the dorsal skin was shaved, washed with povidoneiodine solution, and rinsed with sterile water. A caudally based 3- × 9-cm-long cutaneous pedicle flap was constructed following the general method of McFarlane et al. (23). In this procedure, a deep incision is made down to the areolar tissue plane along three sides through the dermis and adherent panniculus carnosus. Following mobilization and elevation to make certain that nutrient blood supply was severed on three sides, the flap was immediately replaced into position and the three edges sutured together at 5-mm intervals using 3–0 Ethicon Products (Sommerville, NJ). Animals were separated into three groups, and received intravenous injections in a blinded fashion twice weekly. Group 1 (n = 9) received saline, Group 2 (n = 6) received carbamylated EPO (CEPO) (3 µg/kg-bw), and Group 3 (n = 6) CEPO (0.3 µg/kg-bw). Dimensionally-calibrated photographs of the flaps were obtained weekly for 5 wks following surgery and eschar area determined by digital planimetry. In this protocol, pressure-induced ischemia was produced to mimic that encountered by a debilitated hospitalized patient. Over a period of two successive d, we performed five recurring 2-h ischemic episodes, each separated by 30 min of reperfusion (12 h total), were performed, followed by a period of 12 h of ischemia. To reliably elicit ischemia-reperfusion of the skin in freely moving animals, a combination of an implanted steel plate with an externally applied permanent magnet was employed (24). Briefly, under isoflurane anesthesia the left flank was shaved and disinfected. A steel plate (3.3 × 6.3 cm) was then placed subcutaneously and sewn into the underlying muscle. Following a 24-h recovery period, blood flow into the overlying skin was arrested, according to the protocol, by application of a neodynium magnet (47 × 22 × 10 mm thick possessing a surface area of 10.3 cm2) to the central portion of the steel plate. Each magnet was oriented to parallel the long axis of the steel plates, centered to assure a similar compression for each animal, and its position marked on the surface of the skin to allow accurate replacement. Treatment groups (n = 8) were administered saline, ARA 290 (1 nmol/ kg-bw subcutaneously) on d 1 and 2, ARA 290 (1 nmol/kg-bw subcutaneously), EPO (300 IU/kg-bw; ~80 pmol/kg-bw) daily or CEPO (50 µg/kg-bw; ~1 nmol/ kg-bw) once a day for the first 2 d and the animals followed for a total of 14 d. Digital photographs were obtained and necrotic area of the wound determined in a blinded fashion using digital planimetry. For the first day following injury, a clear determination of skin viability could not be made reliably using photographs, so tissue viability was determined by the presence of skin blanching and confirmed by the presence of bleeding to a slight needle prick. To produce a model of infectious peritonitis, an abdominal incision was made under isoflurane anesthesia, followed by ligation of the cecum and then two puncture wounds made using a sterile 18 gauge needle. Great care was taken to minimize the handling of the intestines and to produce a uniform abdominal wound. No feces were expressed nor were antibiotics administered. Four treatment groups were evaluated: sham (n = 8, saline, abdominal incision with minimal manipulation of intestine but without perforation); control (n = 14, cecal ligation and perforation [CLP] followed by saline); EPO (n = 8, CLP followed by EPO 10 µg/kg-bw; ~250 pmol/kg-bw); and CEPO (n = 14, CLP followed by CEPO 10 µg/kg-bw). Compounds or saline were administered intravenously by tail vein once immediately following manipulation of the intestine, and then continued daily by intraperitoneal doses. Animals were scored daily for signs of illness by noting the presence (+1) or absence (0) of the following twelve criteria: piloerection, immobility, inability to hold onto an inclined corkboard, inability to use claws, assuming hunchbacked posture, abnormal gait, lack of exploration of surroundings, unable to grasp a string within 30 sec, diminished reflexes, lack of appetite, weight loss, or moribund. Animals were either euthanized when and if appearing moribund or followed for 8 d after the procedure and then killed. Immediately following death, the abdomen was opened and adhesions scored using the scale of Bothin et al. (25). Wound sizes in different treatment groups were analyzed using nonparametric methods (Mann-Whitney U or Wilcoxon test), by log-rank (Mantel-Cox test), or by repeated measures analysis as appropriate using JMP software (SAS Inc, Cary, South Carolina, USA). In the skin biopsy wound model, we detected no differences among the location of the punch wounds throughout the experiment and little change in eschar size was observed over the first 3 d following injury, irrespective of treatment type. Thereafter, wound size decreased rapidly, with complete closure occurring by d 14 in the saline treatment group. Maximum difference in wound size between the treatment groups was largest on d 7 (Figure 1A). At this time, wounds on the animals that received the tissue protective peptide ARA 290 were 84% healed and differed significantly from the saline group, which was 63% healed and the EPO group, which was 67% healed (Figure 1B). Thus, daily subcutaneous injections of ARA 290 (1 nmol/kg-bw; equivalent to ~ 3,000 IU EPO on a molar basis), a compound with a very short serum half-life of ~ 2 min, effectively shortened healing time in a model of wounding that is not accompanied by significant hypoxia. Tissue protective compounds improve wound healing in a dermal punch biopsy (nonischemic) model. (A) Punch wound size from an animal representative of each treatment group at d 7 following injury. The ARA 290 group (1 nmol/kg-bw) was characterized by a more complete closure of the wound compared with animals that received either PBS or EPO (500 IU/kg-bw). (Standard represents the initial lesion size.) (B) At 7 d following injury, the ARA 290 group was significantly more advanced in healing of the clean, uncomplicated dermal punch biopsy wound compared with saline or EPO (P< 0.001). In the random musculocutaneous flap model characterized by permanent ischemia due to the interruption of nutrient arteries, CEPO treatment at the higher dose (30 µg/kg intravenously; Figure 2A) but not the lower dose (3 µg/kg; data not shown) was associated with an increased rate of healing. In addition to the degree of eschar resolution, the pattern of closure also differed between treatment groups. Animals that received saline exhibited a lateral contraction of the wound, leading to a long, thin scar (Figure 2B). In contrast, the CEPO group healed without constriction, producing a more rectangular scar. Tissue protective compounds improve wound healing in a raised skin flap (permanent ischemia) model. Both treated and untreated rats with a permanently ischemic, caudally based cutaneous flap exhibited a large necrotic wound area that took more than 5 wks to fully heal. (A) At 35 d following injury, wounds in the saline group were significantly larger (P< 0.05) than the group that received CEPO (30 µg/kg twice weekly intraperitoneally). (B) Representative examples of wound size from both treatment groups. Notably, wounds in the saline group healed by transverse constriction which was not apparent in CEPO group. In the decubitus ulcer model, animals received the first dose of a TPC 36 h after the onset of recurrent ischemic episodes. The results (Figure 3) show that animals treated with tissue protective compounds exhibited a much smaller wound size after 3 d than did animals that received saline alone (3–3.9 cm2 versus 6.4 cm2). After attaining a peak wound size, the saline group remained about the same for the duration of the experiment. In contrast, treatment with ARA 290 administered as two daily doses (1 nmol/ kg-bw) resulted in a smaller peak wound size (49% of maximum), which also remained the same size for the duration of the experiment. Two doses of the tissue protective compound CEPO, which has a plasma half-life of ~5–6 h, was similar to daily dosing of EPO: both the EPO and CEPO groups that received daily dosing showed a larger reduction in peak wound area (38% and 30% respectively), but thereafter declined. In the terminal phase of the experiment, animals that had received intensive dosing of ARA 290 exhibited the most complete and rapid resolution of the wound over the 13 d of the study (to ~16% of the maximum wound size; Figure 3B). Thus, like the skin punch biopsy model, daily treatment with ARA 290 resulted in a better outcome than that for EPO in this model system. Tissue protective compounds improve wound healing in a decubitus ulcer (ischemia-reperfusion) model. (A) Recurrent ischemia-reperfusion (I/R) episodes caused by compression of the skin lead to a large necrotic wound that reaches a peak in size by d 5. Animals were subjected to I/R episodes for the first 36 h and then received a first treatment via tail vein. Wound size first measured on d 3 was smallest in animals that received nonerythropoietic tissue protective molecules. The saline group was characterized by a large wound that did not shrink appreciably over the observational period. Although two doses of the tissue protective peptide ARA 290 (with an ~2-min plasma half-life) reduced the initial lesion size at d 3, but no further reduction in size was noted, as compared with the other treatment groups that received daily doses (EPO and ARA 290) or two treatments with a nonerythropoietic tissue protective compound with a longer plasma half-life (CEPO; half-life ~5–6 h). 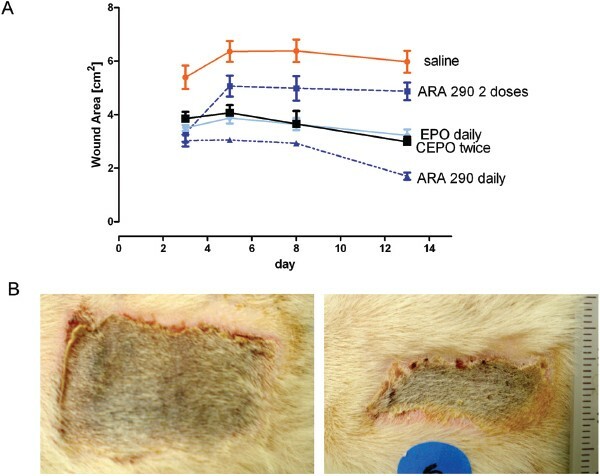 (B) Representative examples of difference at d 8 between wound of a saline-treated animal compared with one having received ARA 290. Rats undergoing cecal ligation and perforation displayed signs of illness within 24 h following the procedure (Figure 4A). The group that received CEPO exhibited a milder course of symptoms that reached a peak by d 3, and then diminished slightly over the observation time of 8 d. In contrast, the saline group reached a maximum illness score by d 4, which was twice as severe as the CEPO group. Additionally, infected animals from both groups lost about 10% of basal body weight over the observation period (data not shown). Although the saline group reached a nadir of weight loss earlier than the CEPO group, from d 3, both groups exhibited the same degree of weight loss, even though the illness scores differed greatly. Serial serum TNFa levels obtained following CLP rose rapidly in all treatment groups except sham, peaking by 3 h, and diminishing slowly over the ensuing 24 h. The mean value of the CEPO treatment group was comparable to the sham group, each being only about half that of the saline treatment group (Figure 4B). Tissue protective compounds improve wound healing in a cecal ligation and perforation infectious peritonitis model. (A) Following wounding, signs of illness (see Materials and Methods) intensified, reaching a peak by 2–3 d. Notably, illness in the CEPO-treated animals was delayed and less severe than in the saline treatment group. (B) Serum TNFa levels from tail vein samples at 3 h following the procedure. The CEPO group exhibited a lower peak level (P < 0.05) and was similar to the sham group, consistent with the less severe clinical scores observed. Horizontal lines are the group means. (C) The mortality in the saline group was significantly more than for CEPO (P < 0.01), whereas EPO treatment was not associated with a significant increase in survival. (D) Scoring the severity of adhesions showed that CEPO treatment was associated with a marked reduction (P < 0.01 compared with saline) as well as a nonsignificant trend in reduction associated with EPO treatment. (E) Representative photos demonstrating the difference between a saline animal (left) and CEPO (right). Note the white, fibrinous membrane almost completely enveloping the opened abdominal surface. This is consistent with highly inflammatory processes, which are not present in CEPO-treated animals. 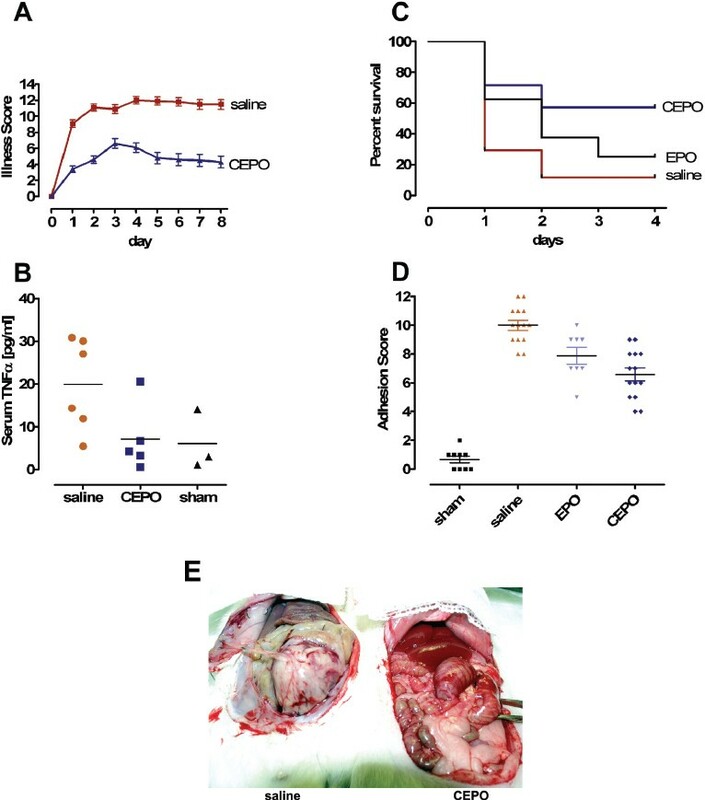 As shown in Figure 4C, animals that received CEPO exhibited an approximate three-fold improved survival rate compared with either the EPO or saline treatment groups. Animals that survived were euthanized at d 8 following the procedure. Interestingly, the severity of adhesions was significantly much worse in the saline group compared with the CEPO group (means of ~ 10 versus 7; Figure 4D). Although the mean adhesion score of the EPO group was less than that of the saline group, the effect did not reach the level of significance. Figure 4E is a representative photograph showing adhesions present in a surviving saline animal compared with one that received CEPO. Using four wound models, each characterized by a different pathophysiology, we have shown that nonerythropoietic tissue protective molecules limit maximum wound size as well as accelerate closure. Additionally, in a model of infectious peritonitis, carbamyl-EPO, a non-erythropoietic tissue protective molecule, suppresses production of the proinflammatory cytokine TNFα, decreases mortality, and is highly effective in reducing scarring. Because TPCs cannot interact with the hematopoietic homodimeric receptor (7), the beneficial effects of TPCs are mediated through the heteromeric tissue protective receptor. An additional conclusion is that effects via the erythropoietic receptor (for example, endothelial cell activation) could account for the inferior activity of EPO on wound healing when compared with TPCs in some of the models tested. Tissue damage is a certainty of life. Normally, injury is contained and then a repair and regeneration phase returns tissues to a normal state. The biology of wounding involves an acute injury phase that activates hemostatic, inflammatory, and proliferative cellular responses that are triggered by molecular signals (26). These “alarmins” subsequently initiate the recruitment of inflammatory cells that both amplify and modulate tissue damage in a potentially positive feedback manner (27,28). One prominent pathological consequence of this process is tissue apoptosis and necrosis. Prior work has shown that a considerable portion of necrotic injury arises from an intensification of ischemia due to nonfunctional capillaries caused by endothelial cell apoptosis, leukocyte plugging, endothelial cell swelling, and vascular leakage, leading to tissue compression by interstitial edema (29,30). If wound volume is successfully contained, endothelial progenitor cells migrate into the injured region supporting the growth of new blood vessels within granulation tissue. Tissues respond to a wide variety of injuries by triggering a stereotyped response involving a balance between destructive proinflammatory cytokines (for example, TNFα) and antiinflammatory responses (for example, locally-produced EPO) (2). However, these are mutually suppressive such that within the vicinity of a wound, the proinflammatory milieu leads to suppressed EPO synthesis. A major role of nonerythropoietic tissue protective compounds is to antagonize the activities of proinflammatory cytokines by reducing their production and attenuating their biological effects (2). In contrast to EPO, the expression of the tissue protective receptor is upregulated within the wound, setting the stage for a potential role of exogenously administered TPCs to rescue cellular targets otherwise programmed to undergo apoptosis. A critical potential therapeutic target is the capillary endothelium, in that capillary dropout frequently occurs because of apoptosis of the endothelial cells, amplifying injury. Administration of TPCs could rescue these capillaries, diminishing wound volume. This phenomenon has been recently reported to occur in the rodent ischemic random musculocutaneous flap model (14) in which EPO administration increased the proportion of functional capillaries within the wound. Another important effect at the capillary level: EPO has been observed to reduce capillary plugging dramatically by leukocytes primed for adherence by proinflammatory molecules (11,12,14,15). However, EPO itself can strongly activate the endothelium producing a prothrombotic state which could neutralize a portion of its therapeutic benefit. This disadvantage is avoided by use of TPCs. In addition to preserving existing capillaries, EPO has also been shown to accelerate healing in the ischemic flap model by amplifying reparative angiogenesis (10–12). It is known that in organ injury, such as a rodent myocardial infarction model (31), EPO mobilizes endothelial progenitor cells (CD34+/flk-1) that subsequently travel via the circulation and migrate into injury sites to drive neoangiogenesis, ultimately reducing tissue hypoxia. Further, tissue-specific stem cells are recruited by EPO to take up residence within the region of injury and differentiate into mature, functional cells (32). Finally, EPO also improves collagen deposition and modulates the number of fibroblasts within a wound site (13). As discussed previously, the affinity of the tissue protector subtype is lower than that of the hematopoietic system (reviewed in Brines and Cerami ). This requires substantially higher doses of EPO for treatment of tissue injury than for erythropoeisis and, as a result, invariably interacts with both receptor isoforms. This is exemplified in the skin flap model in which CEPO was effective at 3 µg/kg-bw (equivalent to ~ 300 IU/kg-bw of EPO), but not at 0.3 µg/kg-bw which is equivalent to ~ 30 IU/kg-bw, a purely hematopoietic dose of EPO. In addition to hematopoiesis, the homodimer also mediates a number of other activities. These include constriction of vascular smooth muscle, activation of vascular endothelial cells into a proinflammatory state (expression of selectins, increased platelet production, and so on) which are generally undesirable when one contemplates the use of EPO as a therapeutic agent for tissue protection. Nonerythropoetic molecules completely avoid this issue (9). It is especially notable that in the decubitus ulcer model, ARA 290 administered daily produced an initially smaller lesion than animals receiving EPO. Several groups using the musculocutaneous skin flap model have reported that high dose EPO is associated with significantly inferior effects on healing than lower doses of EPO (14,33). In these cases, nonbeneficial activities ascribed to EPO, for example, reduction of blood supply by promoting thrombosis or from adverse rheological effects arising from increases in the hematocrit are explained by interactions with the homodimeric receptor. In these experiments, treatment was initiated only following the wounding injury, mirroring many typical clinical situations in which therapy in advance of wounding is not practical. The biological effects can be explained by a triggering of the tissue protective receptor, as ARA 290, which is highly effective, is a compound that has a half-life of only about 2 minutes when administered intravenously in the rat (8). Such long lasting effects are explained by the triggering of complex gene expression programs that provide for sustained activities. Thus, in promoting recovery from wounding, nonerythropoietic tissue protective ligands do not need to be present continuously to promote beneficial effects. The potential clinical utility of TPCs in wound healing is clear for a reduction of healing time in a variety of wound types, including those surgically-induced or those caused by a debilitated patient state, for example, decubitus ulcers. Potential additional benefits in modulation of scarring following peritoneal infections, or other inflammatory processes like endometriosis, bear further investigation. Finally, these compounds could have other beneficial effects not examined in the current experiments, for example, a neurotrophic activity (2) that likely enhances the regrowth of severed cutaneous nerves. Araim Pharmaceuticals is a spin-off of Warren Pharmaceuticals. A Cerami and M Brines are employees of Warren Pharmaceuticals, which is developing tissue protective compounds for clinical use. We thank Deborah Diaz, Daniel Gomez, Annie Zhu, and Xiao-wen Xie for their invaluable technical assistance.